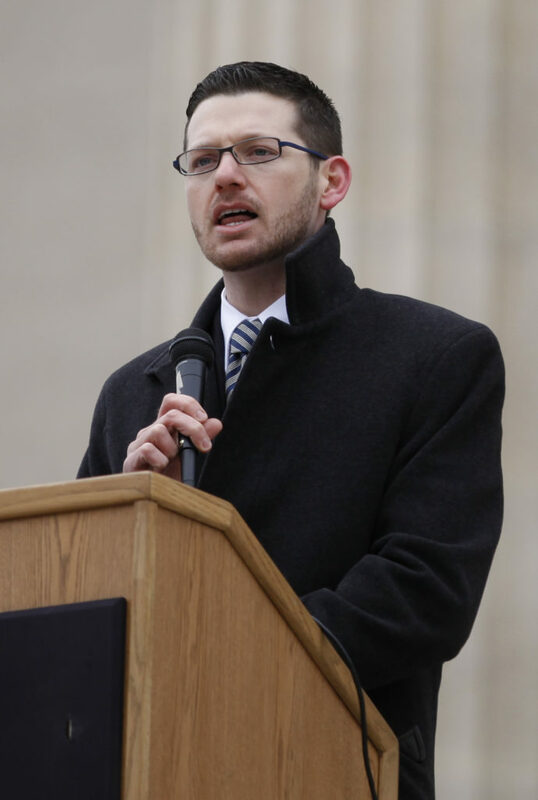 Rep. John Wilson, D-Lawrence, speaks to those gathered during a rally for equality in this Tuesday, Feb. 25, 2014 file photo. Wilson is now sponsoring a provision in a bill in the Kansas Legislature to legalize hemp oil. Topeka ? Democratic Rep. John Wilson, of Lawrence, never thought he’d take up marijuana as a legislative cause, but the struggles of a family in his district to get medical hemp preparations to treat their son’s seizures changed his mind. Wilson is pushing for a House measure that would allow medical hemp to treat seizures. Another pending bill would reduce the penalties for first- and second-time marijuana possession. House-Senate conference committees will continue working on the bills when the Legislature returns April 27 to finish its work for the year. Sixteen states allow the use of oil from a cannabis plant that is low in THC and high in the non-psychoactive ingredient CBD, Wilson said. His constituents moved to Colorado to legally give their son CBD oil to alleviate his seizures, which Wilson said could be avoided. “If you want to move to Colorado because there’s mountains and skiing, that’s one thing. But you shouldn’t have to move there because you want medical treatment,” Wilson said. A similar bill allowing CBD oil treatments for specific medical conditions passed in the House last year and was approved by the Senate Public Health and Welfare Committee last month. Wichita Democrat Jim Ward, the ranking minority member of the House Health and Human Services Committee, said the conference committee would continue discussing the measure when the Legislature returns. Republican Sen. Michael O’Donnell, of Wichita, chairman of the Senate Public Health and Welfare Committee, said the bill would not be a step toward full legalization of marijuana. The oil would offer the benefit of medical treatment without the high. “I think that the legislation that would be discussed and that would ultimately be approved by the Kansas Legislature would be very strict and focused on specific illnesses and not a wide range of uses,” O’Donnell said. A version of the bill lessening penalties for marijuana possession passed 81-36 in the House last year and 38-1 in the Senate in February. Jennifer Roth, a representative from the Kansas Association of Criminal Defense Lawyers, said the measure would free up bed space for more serious offenders. “For simple possession of marijuana, you can do more time or as much time as a person who commits a fairly serious offense,” Roth said. The bill reduces penalties for first-time marijuana possession, which now can bring a year in jail, to no more than six months in jail. The penalty for a second offense would become the most serious misdemeanor, bringing a sentence of up to a year in jail, reduced from a low-level felony. Subsequent offences could result in 10 to 42 months in prison, the current punishment for a second possession offense.